Taking a motorhome to the mountains for a winter ski break will not only save you a considerable amount of money on accommodation rental. It also allows you to chase the good snow, you are no longer limited to selecting a destination weeks in advance and hoping the weather meets you there! 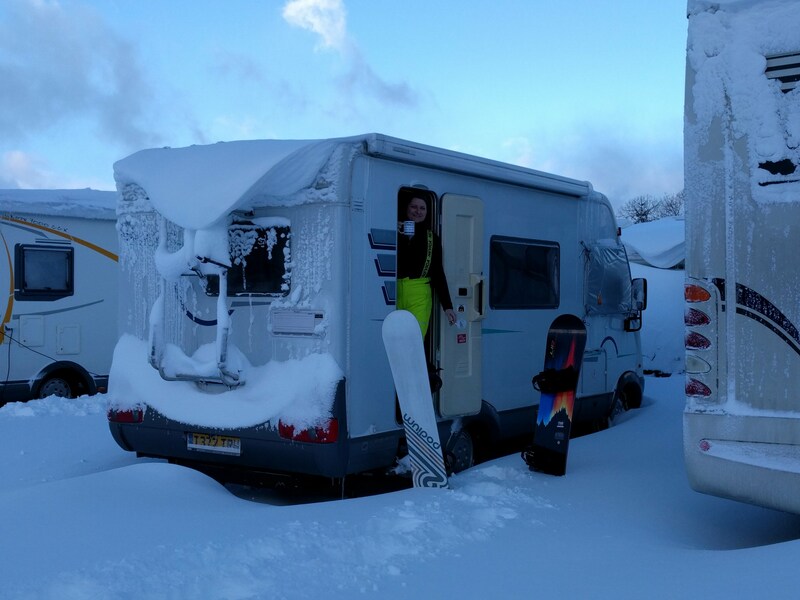 Even if you don’t plan on using a van for ski holidays here are some tips on making sure the rig you chose is suitable for all year round adventures, wherever it ends up taking you. While some people do use van conversions for winter trips, a Motorhome brings two important benefits – more space and (generally) better insulation. In the summer space isn’t so much of a consideration as you will be spending a lot of time outside the van, only needing the inside space for rainy days and sleeping. 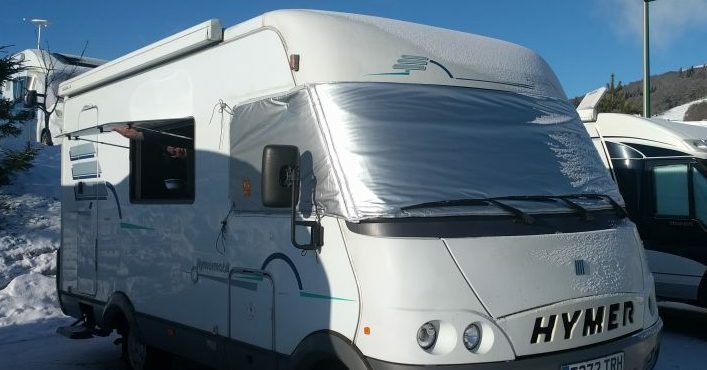 In the winter however having enough usable space to be comfortable living inside will make the trip much more enjoyable, and the additional insulation of a Motorhome should make it a more civilised environment. Van conversions tend to be more compromised in terms of insulation as they are lower and narrower than most Motorhomes so there is less room for thick insulation, and the all-steel bodies do a good job of conduction heat away to the outside environment. If you chose a Motorhome there are two main variants, coachbuilt vans that retain the donor van cab with a Motorhome body on the back, and A-class vans where the whole body is a bespoke unit fitted onto a donor chassis. Older coachbuilt vans can suffer for drafts/colds spots in the cab, making them more difficult to heat, whereas A-class vans are generally better in this respect (they are also wider at the front, being full body width all the way along, which allows more room in the cab area). Modern vans tend to be pretty well sorted in either configuration, but if you are going for an older vehicle an A-class may be a better choice. We use a 1999 Hymer B544, which is a 6m long A-class on a Fiat Ducato base, but there are literally hundreds on options out there which make good ski buses. Researching options you will probably come across the term ‘winterised’, which is one of those unspecific terms that means different things to different manufacturers, but generally speaking looking for a ‘winterised’ van is a good thing as it should mean better insulation and some specific details in the construction for dealing with sub zero temperatures. If the temperatures are consistently below freezing stuff will freeze, this can include fresh water, waste water and even gas (more on this later!). The main way winterised vans combat this is to keep as much of this kit inside the van as possible (and therefore within the heated space). If the fresh water tank on the van you are looking at is mounted under the floor it is likely it will freeze up in winter conditions, so look for one where it is above the floor (bear in mind this will reduce storage space inside the van somewhat). Another thing to look for is where the water pipes are run – some vans that have internal water storage still run the water pipes under floor and when these freeze the whole water system will stop working – even if the main tank is protected from freezing. It is also worth noting that the hot water system relies on getting a feed from the fresh water, so it the fresh water freezes you will have no cold or hot water, and no ability to flush the toilet either! As an example of how manufacturers deal with this in our Hymer the fresh water tank is under one of seats inside the van, and the water pipes run above floor towards the back of the vans, through the threshold strip under the habitation door and into the rear of the van in the kitchen/bathroom area. There is a hot air feed from the central heating system that blows hot air through the habitation door threshold and another that blows into the area under the fridge & sink to prevent any of the pipes freezing. Internet wisdom will tell you that a double-floor van is the way to go for winter use, and they definitely have some benefits. In this type of construction there is a void between two separate floors which contains the fresh and water water tanks, and the void will normally be heated by the central heating system to prevent any of it freezing. There are however a number of single floor designs that are perfectly capable of coping with sub-zero temperatures. The main issue is the waste water tank that will normally be under floor and therefore subject to freezing. (and even if the contents don’t freeze then the valve for emptying it can freeze up, and there is no point in having a well insulated waste water tank if you can’t empty it!). Underfloor tanks are often ‘lagged’, i.e. surrounded by insulation, which can help but if the temperature does not get above freezing even during the day then they will eventually freeze up. Our Hymer is a single floor can with a lagged underfloor waste tank, but there is then a separate feed from the blown air heating system that flows warm air around the valve and inside the tank insulation – we have never had a problem with frozen waste water even a temperatures consistently around ~15degC. A set of externally fitted insulated covers for the windscreen makes an enormous difference. There are covers for some vans available that cover the entire engine bay, these can be useful if there are drafts between the engine bay and the cab, but the windscreen is the main area to worry about. We use a set from ‘TaylorMade’ in the UK that covers the windscreen and both side windows, fit and finish is excellent. There is no getting away from the fact that you will use a lot more gas in the winter than in the summer – so it is important to make sure you have capacity for sufficient gas on board (you can always buy more gas while you are travelling, but bottle rental agreements, continental bottle connection systems etc. mean it it’s one less thing to worry about if you know you have enough gas to last you). We can get through an 11kg bottle of gas in about four days in the Alps in February. 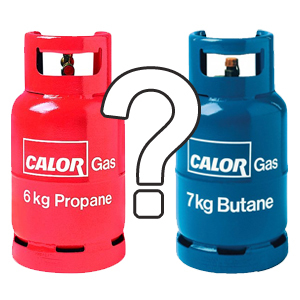 The first thing to note is that you need Propane rather than Butane – Butane won’t ‘gassify’ below about zero degrees Celsius, which means you can have a bottle full of gas but it just stay as liquid in the bottle and not come out as gas! Propane will work down to temperatures well below freezing. You will need a different regulator for propane (if you use a bottle mounted regulator). If you use a bulkhead mounted regulator most of them will work with either Butane or Propane (but bear in mind you will need different connecting hoses and you will get slightly less performance out of propane than butane at the same pressure. I use propane with a 30mBar bulkhead mounted regulator and if works fine, even if the flow rate is slightly lower than with a 37mBar bottle mounted propane regulator. Refillable gas systems (Gaslow, GasIt etc) that let you refill at petrol stations are popular with many Motorhome owners, and for good reason – cheaper gas and no more lugging heavy bottles around. There are however a couple of reasons I don’t use refillable bottles for winter travelling. One is that the refilling equipment etc. takes up some space in your gas locker – with a refillable system I could only fit one 6kg and one 11kg bottle in the locker, with normal bottles I can carry two 11kg bottles. More importantly the LPG on the continent is a mix of butane and propane, in sub-zero temperatures you may not be able to use all the gas in the bottles, as the propane with gassify leaving liquid butane in the bottle. (Interestingly the LPG at the pumps in the UK is generally 100% propane). Also – most petrol stations in the mountains don’t have LPG pumps so you will end up having to drive back down to the main towns to refill. Winter travel means more electricity use, mainly from interior lighting and running blown air heating for long periods (electrical draw from both the combustion fan and the room ventilation fan). While you can’t do much about the electrical load of the heating system changing interior lights to LED bulbs will considerably reduce your electricity consumption. 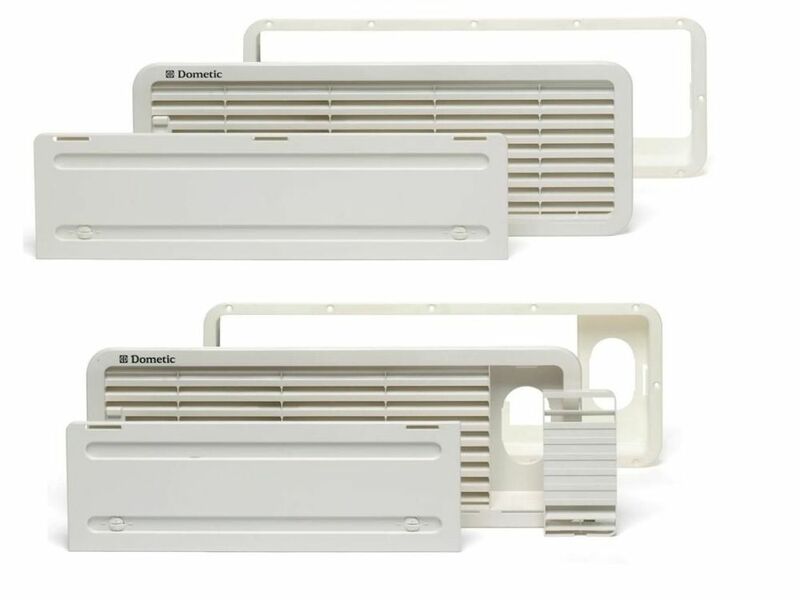 When the outside air temperature is low the fridge needs much less air flow over it’s heat exchanger to work effectively. Hopefully this information has been useful to you – if you have any comments or questions please let me know below! Ducato heater fan only working on high speed? – quick and easy fix! Great website. I am interested to know how you manage with gas bottles. I see that you do not use refillable LPG bottles. When you go skiing, do you take one 11KG UK Propane bottle and then do you source a local (French) bottle when you are at the ski resort and then exchange the local bottle once empty? The main issue we had was the lack of battery power as they are stuck in a metal box underneath the van and the cold seriously depleted the energy available. I have yet to check if we can insulate and heat the box or if we need to re-site them inside. Even after moving the van to a new resort and / or running the generator the available power was very low. Interested to know how you fix your external thermal screen? We have a similar van set up with no cab doors but have nothing to attach to.